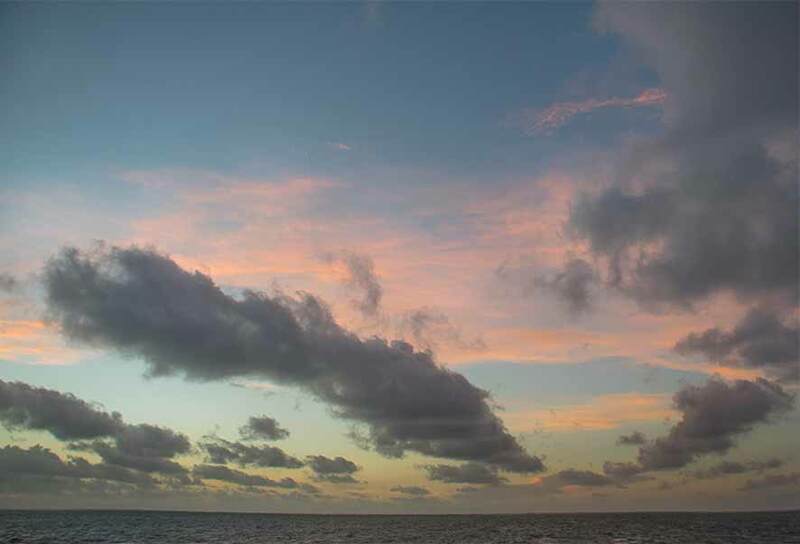 Belize NMS: Generally fair and warm conditions prevail over the area. 24-hour forecast: Sunny with a few cloudy spells today and cloudy at times tonight. A few showers or thunderstorms will affect inland areas this afternoon and southern and some coastal areas tonight. Showers will be isolated elsewhere. General Outlook: For Thursday and Thursday night is for similar conditions to prevail. Today E-SE 10-20 kts Moderate 4-6 ft ISOLATED SHOWERS OR THUNDERSTORMS. Tonight E 10-20 kts Moderate 4-6 ft A FEW SHOWERS AND THUNDERSTORMS MAINLY OVER THE SOUTH. Tomorrow E 10-20 kts Moderate 4-6 ft ISOLATED SHOWERS OR ISOLATED THUNDERSTORMS. Outlook E 10-20 kts Choppy-Moderate 3-5 ft A FEW SHOWERS AND THUNDERSTORMS, MAINLY SOUTH. Last edited by Marty; 08/03/17 05:38 AM. On Ambergris Caye this morning the sea is a little choppy from a Southeast wind at 15 mph. It's a sunny morning and the expected high today is 89 f.
Yesterday was no hotter than most days recently, but it felt hotter, that was because there was less cloud, more sun. Sun heats us if we are working outside in it, as I was yesterday, and it can bounce or reflect of the ground and things to heat inside the house and by shining on the walls. The thermometer readings only read the AIR temperature, which is not necessarily as we feel things. Air with a little cloud, is still coming down from Florida. 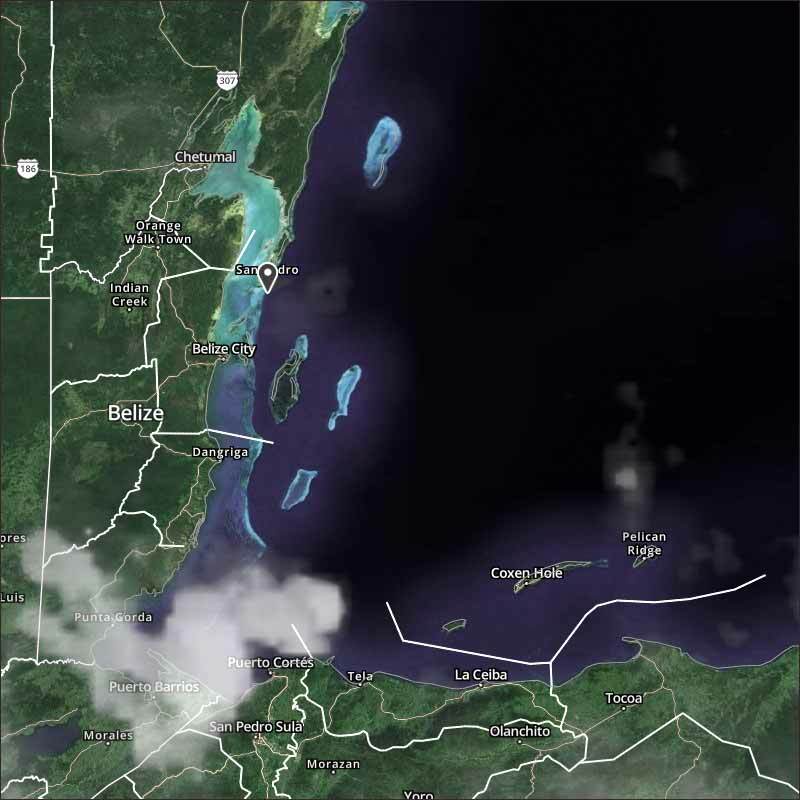 There was a small flair-up in southern Toledo last night and more off east Honduras, so just possible for some rain late today or night, in southern Belize. 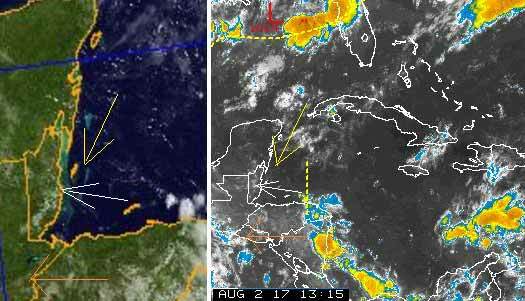 There are three areas of cloud, we should watch, one is already well in the Caribbean, might only bring rain, bt needs watching, the other two are in the Atlantic, no sign of development as yet. Looks like today will be mainly sunny, with some clouds developing, probably no rain.